Mary Ann received an e-book copy of the book. Maribeth received a copy of The Ten Commandments blu-ray. Christina chose a copy of The Lonely Hearts Club by Elizabeth Eulberg. Tal chose Darkness Before Dawn by J.A. London. I sent my 300th(ish) follower a special treat just for being a reader. I like surprising people, so this is probably going to be a new thing here. Jennifer got a copy of Werewolf Smackdown by Mario Acevedo and a bracelet that I made during one of my most recent jewelry kicks. If you were not one of the lucky winners for any of those, you still have until midnight on May 1st to enter the Fairy Tale Giveaway Hop or the huge, multi-blog Socialpunk Giveaway. I'm sure you've also noticed the Blogging from A to Z Challenge going on, and the insane number of posts. Today is the last day, but you can go back and find what I've written on My A to Z Master List. It was a fun exercise, and I plan to participate next year. I have migraines. Usually, that would not be an excuse for me. However, I have ended up in the ER once and close to going on four other occasions. This is an awful season for them, and I'm trying out new medication. They are completely debilitating, and I am ashamed to admit that they are currently ahead in the points. My grandfather died this month. Please, don't start playing the world's smallest violin. I was close to him, and it was very sad. It was sudden, but not completely unexpected. He was in bad health for a long time, but I am grateful beyond words for the time that I did have with him. We all deal with familial losses, but I fell behind because I had to travel several hundred miles out of state to his services. My daughter's school is terrible. Another child touched her in an inappropriate place and manner, and NO ONE AT THE SCHOOL NOTIFIED ME. I've been too busy rolling heads to play catch up. I love blogging, but protecting my child comes first. Period. So, there's April for you. I hope to see you back here in May. I am participating in several giveaway hops and blog tours, so hopefully you'll find (and win!) something you'll enjoy. As always, thank you so much for being a reader here. 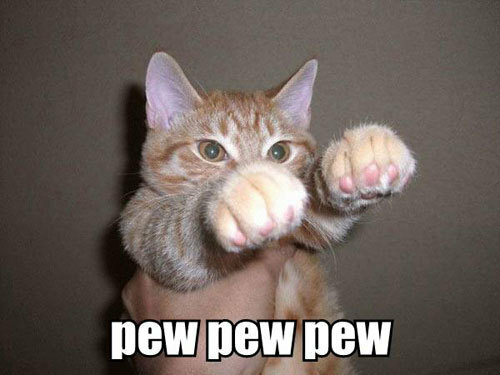 Did you really think you were getting away from here without an lolcat? Edit: I just had another sudden death in the family this afternoon (April 29th), so I'm taking a little bit of time away. I have quite a few posts scheduled, but I do not anticipate responding quickly. I will respond and return your visits - it'll just be a few days. Thank you for your support and understanding with the recent overload of personal issues. I will have a special giveaway for you awesome little creatures soon.